Combination rhythm generator and sound system for the performing entertainer. The STAGEMAN 80 is a multi-function portable PA amp that contains a large number of high-quality rhythm patterns, alongside its professional-quality sound reproduction. 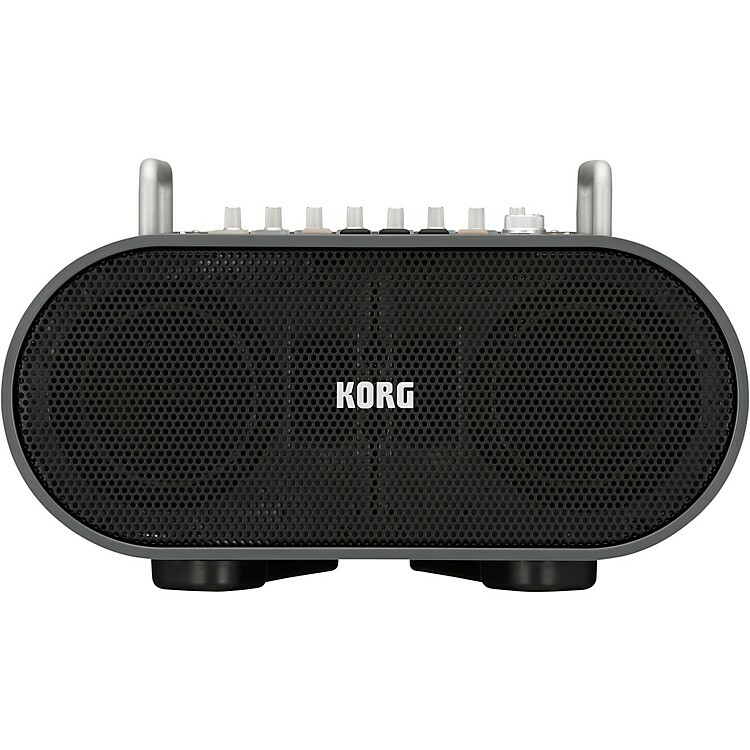 The rhythm component can can even respond to tempo change in realistic ways, due to KORG's new "Real Groove Technology." The STAGEMAN 80 can act as your personal drummer to support your live performances or practice sessions; you can even create a rhythm structure that's appropriate for your own song while using a foot switch to control it in real time. With high-output, high-quality stereo speakers, it can also be used as a live PA. It additionally provides a recorder and audio player, as well as a full-featured mixer. The STAGEMAN 80 lets you perform with optimal sound backed by the ultimate rhythms. The STAGEMAN 80 is equipped with a large number of high-quality rhythm patterns that take advantage of KORG's advanced sound-generating technology. Based on performances by top-ranking pro drummers and percussionists, these rhythm patterns have a great-feeling groove, and utilize KORG's new "Real Groove Technology" that allows natural and musical-sounding phrases to be generated at any tempo. A total of approximately 3GB of rhythm loops are included, covering a range of 24 genres such as 8-beat, 16-beat, unplugged beats such as Cajon, rock, jazz, and boss nova, with two variations for each genre. Just press a single button to flexibly play back the rhythm you want. The high-quality speakers will produce a realistic and live-sounding rhythm session as though a real drum performance is being staged in front of the listener. ou can record your own performance along with the internal rhythm patterns or along with a song you've added to the SD card. You can record with undo/redo, and even register marks at desired locations in the recorded data and play back a region as a loop while you overdub. You can use this capability to create sketches for song ideas, to capture material for later work in your DAW, or create a full recording. "Acoustage" is KORG's original and revolutionary virtual surround technology that can generate a unique personal acoustic space. With only front stereo speakers, it can create an unprecedented three-dimensional acoustical experience. It analyzes the actual sounds of the playback system and applies optimizations to each aspect of it in order to obtain the maximum effect. All-in-one performance system. order today. With stand down: (W x D x H)15.67 x 9.53 x 9.09 in, with stand extended: 15.67 x 12.20 x 11.22 in.